A court reporter is a person that transcribes speech into written form. This is done in order to produce official transcripts at various legal proceedings. A transcriber may also be used in other official settings such as conferences or depositions at private law firms, or meetings or hearings at state agencies, trade associations, and non-profit organizations. To explore this concept, consider the following court reporter definition. noun. 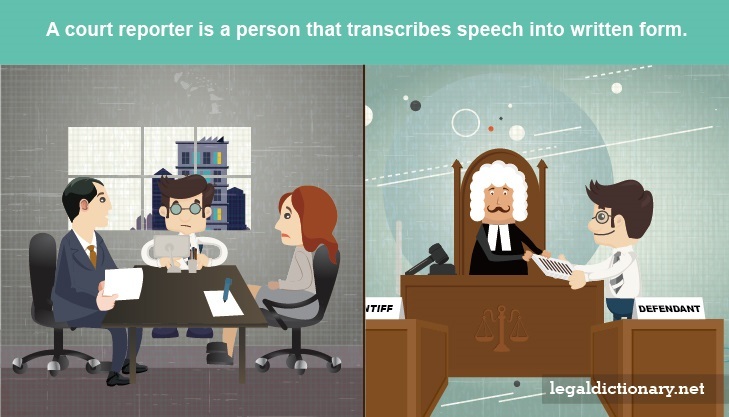 A stenographer or short hand reporter employed to record and transcribe an official verbatim record of legal proceedings, both in and out of court. A court reporter, also known as a “court stenographer,” or “stenotype operator,” is a person whose job it is to create official word-for-word transcripts of spoken words at trials, hearings, depositions, and other official proceedings. The majority of court reporters work in state or local governments, most contract privately for proceedings outside the courthouse, and some work for state and federal legislatures, and in other legal environments. Community colleges as well as technical schools offer various programs that culminate in either a certificate or associate’s degree in court reporting. Some states require that court reporters working in a court setting also be certified by a professional association, such as by the National Court Reporters Association (“NCRA”). Court reporting courses focus heavily on English grammar and phonetics, and legal terminology. Students also learn a great deal about legal procedures, use of transcription machines, and typing speed. After mastering the required courses, students are given certification or licensing exams, which consist of a written test and a skills test. In most states, after an individual has completed the educational and certification requirements, he or she must complete on the job training. In many jurisdictions, a court reporter is required to be a notary public, as they must administer oaths to witnesses, and to certify that their transcripts are a true account of what was said during the proceedings. The minimum speed required by the NCRA to become a court reporter is 225 words per minute, and most associations require a 98 percent accuracy rate on testing. Once an individual has become certified or professionally licensed, he or she is required to attend continuing education (“CE”) throughout their career. Court reporters play a critical role in the courtroom process, and they most frequently work in legal settings. However, some court reporters assist judges and attorneys with certain tasks, such as organizing records so that users can search for information efficiently. In some instances, court reporters do not work in a legal setting. For example, one of the popular court reporter jobs is broadcast captioner, whose duty it is to provide closed captions for television programs. Whatever the type of transcription career, court reporter salary is a draw to many. As of 2014, court reporter jobs are one of the best available that does not require a four-year college degree. The median court reporter salary is $55,000 per year, which can be broken down into a mean hourly wage of $26.44 per hour. A mean salary is a salary at which half the workers in a given occupation earn less, and half earn more. Professional License – A document provided to an individual who has completed a series of examinations and/or practices in a certain subject, proving that he has the knowledge, skills, and experience to perform a specific job. A Court Reporter is really a very important person in the Court and his job is very difficult.